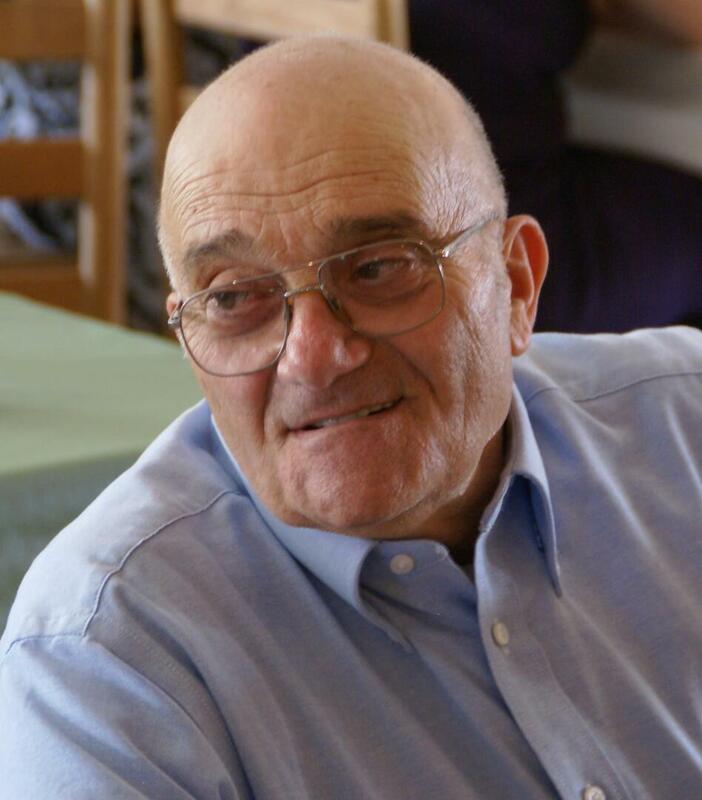 Frank Andrew Berardinelli, 83, passed away at his home on Friday November 16, 2018. He was born on January 10, 1935 in Stamford, Connecticut to the late Domenico and Inez (Bertola) Berardinelli. Frank was a wonderful, kind, honorable and loving man who was happiest when surrounded by family and friends. Frank was very proud of his first-generation Italian-American heritage and was fluent in Italian. He graduated from Stamford High School in 1952. After graduation, he served his country as a proud member of the U.S. Army from 1953 to 1956. After meeting Betsy Irish at a local Stamford soda fountain, they were married on February 27, 1960, in Stamford, CT where they started their family. Frank managed transportation services for Consolidated Diesel until 1967 when the family moved to Vermont to open Berardinelli’s General Store in Fletcher. Frank and Betsy owned this store until it burned down in 1979. After purchasing and renovating St. Luke’s Catholic Church in Fairfax, they opened the second Berardinelli’s General Store in 1981 and owned the store until 1995 when they both retired. During the years that the family lived in Fletcher, they also had a camp on Metcalf Pond where many family and friends made lots of happy memories. Frank enjoyed teaching his children and grandchildren to fish, entertaining family and friends, dancing, watching and armchair-coaching the New York Giants, sharing his love of J&B Scotch with whoever would join him, and engaging in lively political discussions. While in Fletcher, he volunteered as the Town Fire Warden and was a member of the Town Zoning Commission. After retirement, Frank and Betsy enjoyed traveling to Italy, Ireland, Scotland, Wales, England, Canada, and across the U.S. In 2000, Frank and Betsy moved to Grand Island, FL where he joined the community social club and started and managed the bi-weekly coffee mornings at Sun Lake Estates for many years. During his time in Florida, Frank was a member of the Volunteer Fire Department. He enjoyed playing golf, relaxing in the hot tub, participating in the Miss Sun Lake pageants and other club activities. He was an excellent card playerand was very proud of his Texas Hold‘em championship wins. In 2014, Frank and Betsy moved back to Vermont to be closer to family. Frank was a member of St. Ambrose Catholic Church. He could often be found enjoying time with his grand puppies, watching action movies and visiting with family and friends. Frank is survived by his wife Betsy Irish Berardinelli of Monkton; his children: Lynn Berardinelli of Monkton; Dominick Berardinelli and his wife Beth of Dillon, CO; Edward R. Berardinelli of Fairfax; Deborah (Berardinelli) Hamblin and her husband Mark of Monkton; Brenda Berardinelli Lombardo and her husband John of Essex Junction; his grandchildren: Mark Brito; Stephanie Hamblin; Katie Hamblin; Jeremy Pianalto and his wife Sarah. He is also survived by:Steve Brito, son-in-law of Cotuit, MA; Marge (Irish) Jagodzinksi and her husband George; Ronald Irish and his wife Barbara,Linda (Irish) Turner and her husband Robert; Christine (Irish) Williams; Valerie Irish; Sheila (Irish) Reece and her husband Bret; Mark Irish and his wife Debra. He is also survived by several great grandchildren, nieces, nephews and cousins. He was predeceased by his daughter Sylvia Berardinelli Brito; Brother Edward J. Berardinelli; Sister Vanda B. Taddeo; Brothers-in law and sisters-in-law:Charles (Joe) Irish; Janet (Irish) Carpenter; Larry (Ike) Iris; David Williams. American Legion Post #19, Attn: Alan Smith, PO Box 292, Bristol, VT 05443. The family invites you to share your memories and condolences by visiting www.awrfh.com. Additional Information	Visiting hours will be held on Saturday, December 15, 2018 from 2:00 p.m.– 5:00 p.m. at A. W. Rich Funeral Home – Fairfax Chapel. A funeral service will be held on Sunday, December 16 at 1:00 p.m. at St. Ambrose Catholic Church in Bristol. Dad we love you and miss you. My first husband, David Gearin, and I lived in Fletcher in the mid-1970s and Frank and Betsy were, for us, The Heart of Fletcher. We so valued them and their store that we made sure to buy everything we could at Berardinelli's Store. Our hearts were broken when we learned of the fire that consumed the store, and knew that Fletcher would never again be the same. I have always been grateful for them and how they made us -- two twenty-somethings "from away" -- feel welcome. Dear Cousin Frank, We had a few short summer stays way back in Stamford, both close in age. I remember Zia Inez, my Father's sister, and Zio Domenico during our family get-togethers. One incident in your back yard with a bb gun. You aimed and hit the popsicle stick I held out. On my turn I missed and hit your hand instead! Don't recall your middle name is Andrew. Named after my Father or our Grandfather or our Great-grandfather. Rest in peace, my friend. Betsy, Lynn, Dominick, Eddie, Debbie, Brenda and family – I am so sorry for your loss. I remember when I was finally old enough to bring Gramma Hooper’s donuts up to the store in town for Frank (and Betsy) to sell (and heard the story of Eddie (or Dominick – depending if my father was telling the story ) bringing them, and maybe not all made it?). And, I am so grateful getting a ride with Frank (and Betsy) to the store in Fairfax early in the morning so I could catch my ride to school in Essex. Frank was so incredibly kind and generous and he (you all) have always felt like a part of our extended family. Prayers and love to you all during this difficult time. As a kid growing up in Fletcher always loved stopping in to see Frank and Betsy running the store, always a smile and friendly. same as when they moved to their store at Steeple Market. he was a great man. from our entire family to his our thoughts and prayers. Frank was quite possibly the kindest man I have ever met. His smile made me feel welcome. He always greeted me as if I were his family. He had a warm laugh and big heart. He will be missed.